If you’re planning your menu for April there are a few holidays to consider and many fresh fruits and vegetables making their entrance for the spring. Full Moon on April 19th is called the Pink Moon. National Garden Month, National Frog Month and National Poetry month!! Full Moon on May 18th is called the Flower Moon. May is National BBQ, Egg, Strawberry and Salad Month!! • Start adding fresh greens and more herbs to brighten the palate (and the plate!). • Introduce delicate baby vegetables and petite items to mirror the growing seasons. • Add early flowers; nasturtiums, pansies, marigold confetti to salads to brighten them up visually and contribute a slight pepper flavor. • Pea tendrils and fava tops (tips) both have a more delicate version of the flavors of the items they’ll grow into later in the summer. • Alliums and fresh legumes become prominent contributors to the menu options. April is always a little sketchy as spring crops are very weather dependent and don’t have a strong hold on the earth yet. Transitions between growing regions add to the confusion and chefs need to be able to be flexible; write specials that can accommodate changes and encourage customers to embrace the season. 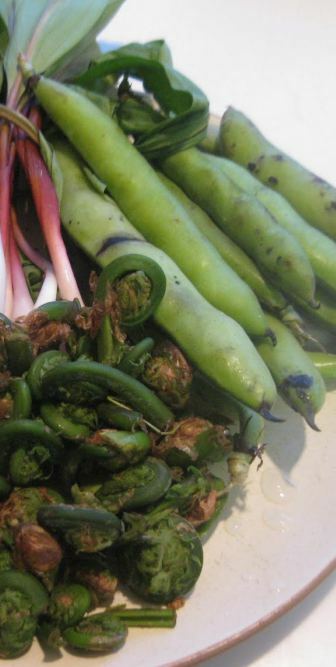 Wild-craft harvests of Morels, ramps (very scarce this year with the warm temperatures nationally), fiddleheads (the western fiddleheads started mid-March, eastern begin in April) and stinging nettles can add some seasonal splash to the menu. The mid-month is Passover and Easter followed by Earth Day. On Arbor Day, think of planting a fruit-bearing tree in your green space. This month is one of the few times that truly delicious peas and carrots are feasible to serve together. The peas are much more delicate than most people believe as they are filled with natural sugars that convert to starch within hours. If they are picked too soon, the inner peas are small and don’t have much yield, if they are picked too late, they are large and starchy and not very palatable. But when they are picked just right – what a wonderful spring treat!! Be sure to cook the carrots first and then add the shucked peas at the last moment with a little bit of mint and fin au beurre (or finish with butter). If you can’t get or keep enough good English Peas in your walk-in, consider using Snap or Snow peas on your menu. A great way to write this as a menu item would be ‘legume d’jour’ and then your choices could also include fava beans and fava tips when these delicious green spring veggies become available. As a chef and a diner, there are two important factors to remember when ordering, prepping and eating these items: Spring products are very delicate – the starches, sugars and flavors can shift quickly depending on when they were harvested and how they are stored; seasonal items are shortlived celebrations of the shift in season, enjoy them when they are available because frozen morels and ramps are poor substitutes for the fresh item. One final special item that becomes available in April is the green almond. Related to the apricot, plum, peach and nectarine, this drupe is a delicacy. Technically a fruit, the green almond is generally available through June, when the outer shells become too tough and the center endosperm firms up and solidifies. Fresh green almonds are a Mediterranean delicacy and the combination of fuzzy outer young shell and gelatinous, lemony inside is an interesting addition to salads and sauces or stews. The nut provides a light lemon, citrus, grassy flavor and is a great item to chiffonade or thinly slice on a mandolin and add as a unique spring ingredient. Cherries and other stonefruit should begin in May with earnest … A good rule of thumb – California Cherries start on Mother’s Day and continue through Father’s Day. Spring Porcini also usually become available in May…. Corn – new crop Calif.